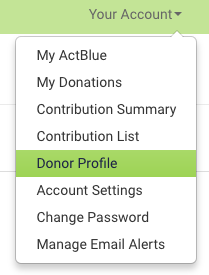 If you have an ActBlue Express account, we suggest checking your tip setting in your Donor Profile. Just log in to your ActBlue Express account here. Navigate to the Your Account tab in the menu bar at the top of your screen and click Donor Profile. Scroll to the bottom of the page and you’ll see the tip options. Here, you can choose to have a 10% or 20% tip for us left automatically on all of your contributions, so you can donate and tip with one click. If you’d like to decide every time you make a contribution whether or not to leave a tip, select the “No Thanks” option here. You’ll still be able to leave a tip in the future if you’d like, but you’ll need to manually select one on every contribution form you give to. If you don’t have an ActBlue Express account, or if you’re not sure if you have an account, feel free to reach out to us at info@actblue.com, and we’d be happy to look into your contribution for you. 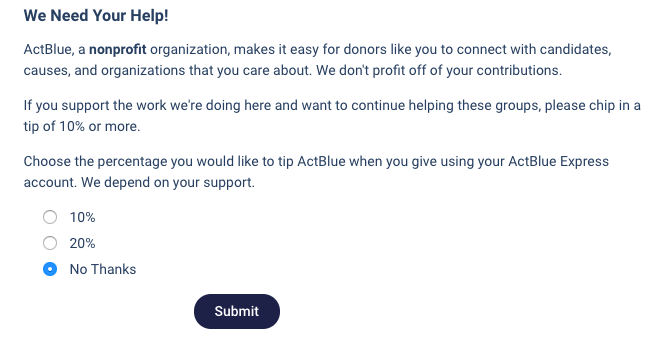 What are ActBlue tips for?